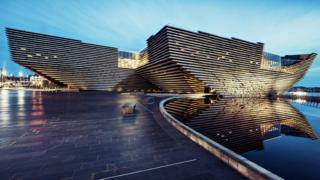 Dundee's £80.1m V&A Museum of Design will open on 15 September, it has been confirmed. The museum's opening exhibition will be Ocean Liners: Speed & Style, which will "re-imagine the golden age of ocean travel". It will also feature Charles Rennie Mackintosh's fully-restored Oak Room at its centre. Work on the building's exterior is complete and the museum fitting-out will begin in February. The Ocean Liners exhibition will feature a wooden panel fragment from the first-class lounge on Titanic, the largest remaining fragment from the ship. Other items include a Christian Dior suit worn by actress Marlene Dietrich as she arrived in New York on board the Queen Elizabeth in 1950, and the painting Paquebot 'Paris' by leading US Precisionist Charles Demuth. V&A Dundee director Philip Long said: "In just eight months we will be opening the doors and welcoming our first visitors. "V&A Dundee is set to be a vital new cultural organisation for Dundee, the UK and beyond, helping to change understanding of just how important design and creativity are to people's lives." Construction work on the museum, which was designed by Japanese architect Kengo Kuma, began in March 2015. The museum gave a glimpse into its Scottish Design Galleries last November by revealing a handful of the 300 or so featured objects. These range from a 15th Century book of illuminated manuscripts to the latest in computer gaming technology. A diamond-winged Cartier tiara commissioned by the Duchess of Roxburghe will also be displayed for the first time in public in the galleries. Business owners in nearby Union Street told BBC Scotland they were excited at the opportunity the museum will bring to the local area. Nicola Schweikert, who runs The Palais, a 1950s-themed tearoom, said: "Obviously we see it every day, so it is very prominent there and people coming in from out of town just wonder at it. "I'm a nostalgic person, I like old-fashioned buildings and things but it's really grown on me now. "It's a wonderful monumental building and part of the city now." Image caption Cafe owner Nicola Schweikert said the museum was now "part of the city"
Jewellery designer Lorraine Law said: "Twelve years ago I set up in Dundee but I never in a million years thought that this was going to happen. "I could see things moving forward. "There are designers from all walks of life - fabrics, textiles, jewellery, sculpture. "It is a city of design and that's why the V&A belongs here."